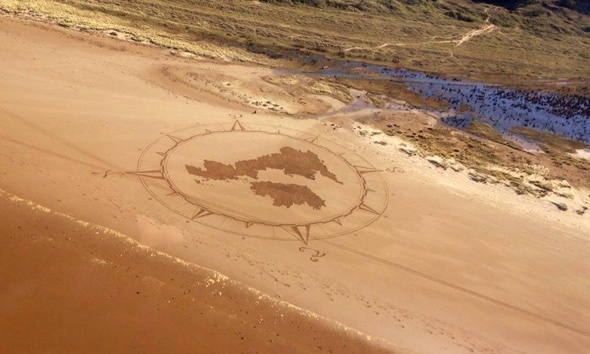 An anonymous artist dubbed the 'Banks of the beach' is making waves in Wales. Locals and tourists have been snapping pictures of his huge designs on Gower beaches and sharing them on social media. Many have been left scratching their heads, wondering what the meaning behind them is. Speaking to the South Wales Evening Post, the mystery artist said: "One down at Rhossili, when I went back up to the top of the hill to take a few photos, people were asking 'what's the message' and 'are you signalling UFOs?'. "It's quite good really especially all of the hype around it and it's good to get people talking and wondering about what it's all about." But, apparently, there's no such mystery behind the sand sketches. The 'sandman' said he was inspired after seeing somebody creating beach images in Cornwall. He explained: "I thought why not give it a go and see what happens. "It's quite relaxing spending a couple of hours wandering around in circles. People come up and ask what I'm doing, and I just say 'I don't know, but it's better than sitting playing on a games console'." According to theMirror, he added: "Anybody can pick up a rake and do it. "It's like kids sticking their finger in the sand and drawing, just on a larger and more precise scale." Kate and Wills have been sighted here on several occassions - so who knows, if you visit Aberffraw you may spot the couple on one of their regular country walks! Did you know? In Welsh mythology, Aberffraw is the site of Branwen and Matholwch's wedding festival where Efnysien maimed Matholwch's horses. A sandy beach stretching three miles and backed with sand dunes, at low tide Rhossili Bay is expansive, giving you the option of walking over to Worm's Head (pictured). Did you know? Rhossili Bay has been used as the setting of New Earth in Doctor Who and the bay was used in Torchwood: Miracle Day. A beautiful beach laden with history, Whitesands Bay is popular with surfers and has been described as one of the best tourist beaches in the world. Did you know? At very low tide the remains of an ancient submerged forest can be seen on the beach - a bear jaw was once discovered here. A small harbour resort located within the Snowdonia National Park, Aberdyfi offers a range of watersports including sailing, canoeing, fishing and boat trips. Did you know? The Romans established a track into Aberdyfi as part of the military occupation of Wales around AD78. A truly peaceful corner of the world with wonderful views, Dinas Dinlle is the perfect place to take a ramble. Did you know? From the village, you can take pleasure flights around the peninsula or even take flying lessons. Poppit Sands, a half mile beach backed with sand dunes, is situated at the beginning (or the end, depending on which direction you're heading) of the Pembrokeshire Coast Path. This beach is also a popular spot for power kiting. Did you know? Bottlenose dolphins can often be spotted around the bay, as well as porpoise. The beach, which has earned a Green Coast Award, has safe swimming conditions and an abundance of wildlife including seals, porpoises and dolphins. Did you know? Mwnt was the site of an unsuccessful invasion by Flemings in 1155 (later celebrated as "Red Sunday"). It's said the bones of the defeated invaders were sometimes visible under the sand during the early 20th century. Marloes, an isolated stretch of sand, is rarely busy. It offers views to Skokholm and Gateholm Islands and is a good spot for surfing and horse-riding. Did you know? The remains of neolithic to medieval settlements can be found on the island. Rocky outcrops, sealife, a Millennium Celtic Cross and rockpools can all be found here. The sea is clean and safe for swimming, too. Did you know? Legend has it that Saint Ffraid, the patron saint of Trearddur Bay, from Kildare, Ireland was carried over the Irish Sea and arrived at the beach on a square of green turf. Harbour Island is where you will find the Bahamas' most famous pink beach which stretches three miles along the eastern coast. Pinks Sands Beach is protected by a coral reef and its sand is a composition of tiny microscopic animals known as Foraminifera, which grow bright red shells that wash ashore and mix with the white sand to create a pink hue. The Caribbean island of Barbuda is also home to pink sand beaches, with its most famous Pink Sand Beach, often deserted. The beach boasts silky sand over eight miles, from Spanish Point to Palmetto Point. Its champagne colour glows rose thanks to the crushed coral in the sand. The water is clear and fantastic for snorkelling. There are many interesting beaches in Hawaii but Big Island's Papakolea Beach is arguably the most unusual of them all. The green sand stretch, located near the southern tip of the island, owes its olive hue to a semi-precious gem called olivine. The ocean erodes the stones, crushing them into the fine sand. Red Beach in Santorini is one of the most famous spots on the Greek island and is the definition of a volcanic beach. It is named after its rich red hue and backed by cliffs of the same colour. The beach is located just steps away from the ancient site of Akrotiri and can get quite crowded in the summer due to its small size. Another red sand beach is Kaihalulu, a pocket beach on the island of Maui. Its sand is deep red-black, contrasting with the blue water, black sea wall and green ironwood trees. The colour comes from the cinder cone hill on the northern end of the cove and makes for a very unique sight on the Hawaiian island. The black sand at Maori Bay in New Zealand's North Island is caused by the iron content derived from the ancient volcanoes of the area, including the large Kaipara Volcano, which erupted millions of years ago. The 37-mile stretch is popular among surfers but even greater an attraction than its dark sand is the Gannet Colony, and the birds' busy goings on between August and March every year. More dramatic in colour than Muriwai is the black sand Punaluʻu Beach on Hawaii's Big Island, which is made of basalt and created by lava flowing into the ocean which explodes as it reaches the ocean and cools. The beach can be dangerous for swimming but it’s frequented by endangered Hawksbill and Green turtles, which are often seen basking on the black sand. The multi-coloured Glass Beach in Fort Bragg is covered in sea glass created from years of residents dumping rubbish into the area of coastline. Every year, a Glass Festival is held but the glass is slowly diminishing due to tourists collecting it on their visits. There are currently plans to replenish the beach with discarded glass. Australia's Hyams Beach holds the Guinness World Record for having the whitest sand. Many pictures of the beach show it looking so powder white that it is almost blinding. The beach is located on the southern shores of Jervis Bay and is surrounded by Jervis Bay Marine Park and Booderee National Park. The brilliant white sand at Siesta Beach in Florida earned it the number one spot in America's best beaches list. At the Great International White Sand Beach Challenge in 1987, Siesta Beach was recognised as having the 'whitest and finest sand in the world.' While many other beaches are made mostly of pulverised coral, Siesta's sand is 99 per cent quartz and is so reflective that it feels cool, even on its hottest days. Famed for its occasional purple sand, Pfeiffer State Beach's unusual hue comes from manganese garnet deposits found in the surrounding hills which erode and wash down to the beach. Not all the sand on the beach is purple and can be found in patches along the northern part, most often after a storm. Ramla l-Hamra means 'Red Beach' in Maltese but the sand here resembles more of an orange hue and is surrounded by rocks with golden limestone and volcanic ash, which when combined give this interesting shade. The sandy strip in Gozo is popular with snorkelers, families and locals. Chocolate-coloured Rockaway Beach, in Pacifica, owes its unusual colour to blue-grey limestone mixing with volcanic greenstone. Erosion has decreased the size of the beach but it remains popular with visitors to its restaurant and shopping venues. The beach is known as one of the cleanest in the San Francisco Bay Area. Some say Sardinia's Porto Ferro is an orange beach but we think its mile-long sands are a gorgeous gold, made up of native orange limestone, crushed shells and other volcanic deposits. Backed by large ochre-coloured sand dunes, the beach is located near the Baratz Lake, the only natural lake in Sardinia. Made up of around 74 different hues, Rainbow Beach is possibly the most colourful beach in the world. It is just over half a mile long and much of the sand colours stem from a rich content of minerals, including rutile, ilmenite, zircon and monazite. According to an ancient Aboriginal legend, the sands became colourful when rainbow spirit Yiningie lost a battle over a beautiful woman and fell onto the cliffs. Grey sand beach Shelter Cove is a remote stretch that was created by years of erosion of the nearby cliffs. The large beach with offshore reefs, just north of the town of Shelter Cove, is popular with hikers and visitors who come to explore the rugged terrain. Most visitors to the Maldives don't expect the sandy beaches to be anything but white, but Vaadhoo Island on the Raa Atoll is home to a natural phenomenon which turns the beaches electric blue. The bio-luminescence happens when microscopic organisms react with oxygen in the water to produce light.